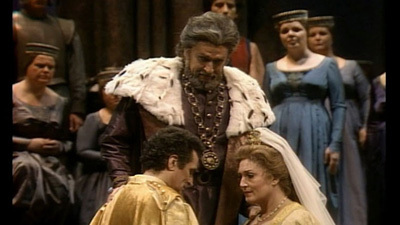 When this sumptuous production by Giancarlo del Monaco opened in 1995, legendary tenor Plácido Domingo gave a riveting performance as the fiery revolutionary Gabriele Adorno, a tenor part. In the 2010 revival, he made history by taking on the baritone title role, one of Verdi’s most fascinating characters, and thrilling audiences with his multifaceted and gripping portrayal. Boccanegra is beset on all sides, juggling political adversaries bent on murder with his love for his long-lost daughter Amelia (Adrianne Pieczonka). James Levine’s conducting brings out all the color and surging emotion of Verdi’s magnificent score.